Couple a high number of protocol amendments with a short duration in between those amendments and the challenges of tracking versions, submissions, and signatures across multiple sites or regions becomes exponentially more complicated. When part of a large study, an amendment could result in the need to collect hundreds or even thousands of documents; therefore, considerable knowledge and expertise is required to ascertain precisely which documents are needed to fully support a protocol amendment. It’s no wonder that missing documents associated with protocol amendments is one of the most common types of inspection findings. A protocol amendment contains the amendment itself, as well as a signature page from each active site. In addition to the basic requirement of collecting signature pages, the other documents required to support an amendment may vary based on the changes being made to the protocol. In some circumstances, changes to the protocol as well as the timeline of implementation can be region or site specific. Because of the propensity for the consequences of protocol amendments to vary across a trial, it is important that expected documents and filing expectations are communicated to all stakeholders as far in advance of an amendment as possible. Clear pathways for handling protocol amendments should be outlined in the TMF plan before the trial begins. Staff should be trained on the TMF plan at the investigator meeting or before beginning their duties. In conjunction with comprehensive TMF training, the features of modern eTMF systems can be a true asset to your team. Many new eTMF systems have capabilities which allow users to create and cascade placeholders in response to specific events, including protocol amendments. Stakeholders with this type of eTMF system can select the applicable documents, countries and sites involved, and with a few clicks easily track whether documents have been received and where they still need to be collected or filed. Additionally, TMFs with this functionality may even allow for the assignment of due dates that alert stakeholders when their action is needed. Unfortunately, in many legacy TMF systems without event tracking and placeholder creation, manual tracking of amendment documents is the only option. 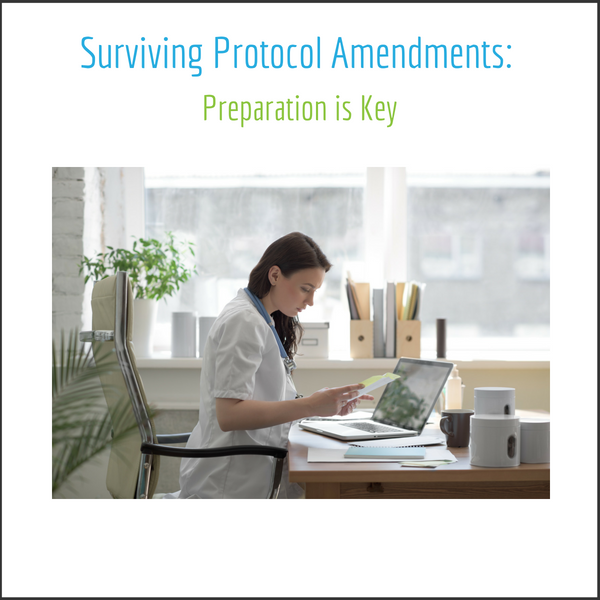 Although much more time and effort is required by stakeholders, a protocol amendment can still be rolled out successfully with the assistance of an event-specific checklist. This checklist, which should be created by TMF leaders in advance of the amendment, outlines all the documents associated with a submission that must be collected for each site and country. Once the checklist is finalized, it can be distributed to all stakeholders as the primary tool for locating and tracking documents. Stakeholders then gauge their progress in rolling out an amendment by using the eTMF’s search function, comparing the checklist of expected documents to those currently filed. Whether you are utilizing a modern or legacy eTMF system, successfully implementing a protocol amendment means accurately identifying and communicating what documents will be impacted. Preparation for a protocol amendment should begin far before the need for an amendment is even identified. Pre-study training ensures everyone knows how information will be communicated and allows all TMF stakeholders to benefit from the knowledge of past successes and failures. Yes, more time and effort will be required if manually tracking a protocol amendment, but keep in mind, even with a modern system, the features of your eTMF system are only as smart as your TMF team.